This Colorful Hmong Hilltribe embroidery is 11.5 inches tall x 14.5 inches wide x 6.5 inches deep. Featuring a Zipped main pocket with inside zipped pocket and two zip side pockets that are perfect for quick-reach items. Easy-wipe and easy-see lining. Tassle Not Included. 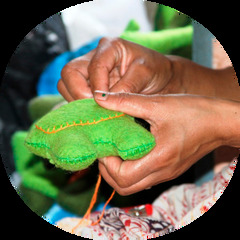 All of our unique global travel inspired gifts & goods come from Fair Trade verified artisan groups. These gifts for travelers provide fair-paying, safe, sustainable, reliable jobs to talented beautiful humans around the world! Thank you for helping make the world a better place.